The whole place erupted with clapping whistling and shouting. People were on their feet and cameras were clicking. Any worries I had about Andre not getting a rapturous welcome were forgotten. Andre and JSO [Johann Strauss Orchestra] marched waving and smiling down the aisles towards the stage. Everyone knew they were in for a night of pure fun and wonderful music. Andre looked magnificent and handsome on stage. Blue eyes shining. Wide dazzling smile. The music and applause died down and the audience was eager to hear what Andre had to say. Every ladies heart melted at the sound of his voice. I’m a little puzzled by the Rieu phenomenon. There is a cult of personality, obviously. Rieu’s wardrobe, hair, and conducting style (conducting while holding or playing his violin) are all deliberate evocations of the 19th century. The artistry is sufficient for the material, but not exceptional. Rieu tends to turn most everything he plays into a sort of Johann Straussian bonbon. And if the music can’t be so conformed he doesn’t play it. Australian reviewer Eamonn Kelly commented on Rieu’s public and private demeanor. Behind the scenes he is a bespectacled, conservatively dressed, mild-mannered Dutch businessman and a perfectionist with tight control over every aspect of the Rieu industry. On stage, he presents as a carefree spirit in full Strauss attire, overflowing with joie de vivre, spontaneity and playful informality. 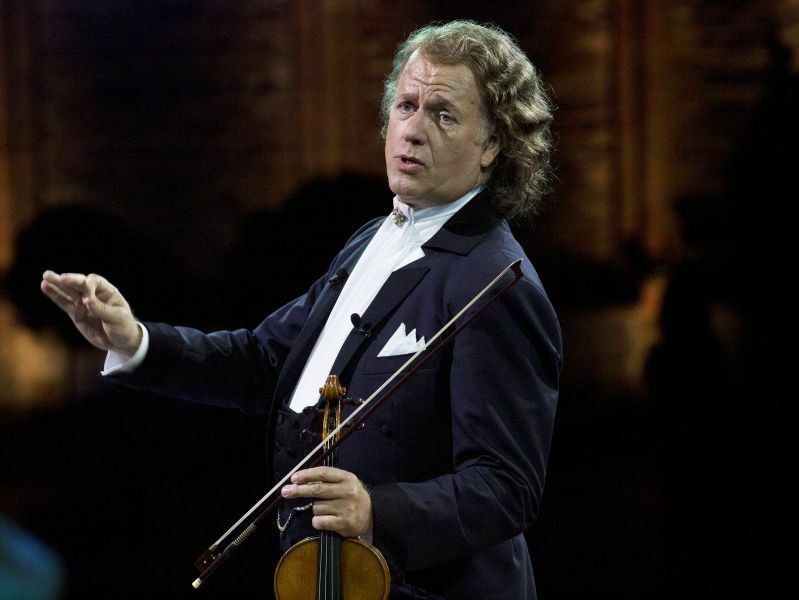 The sheer spectacle involved in a Rieu concert can be outlandish. In his Rieu profile for Strings magazine David Templeton notes that Rieu doesn’t like anyone to refer to his concerts as shows. However, doesn’t this sound just a little over-the-top showy? Perhaps what confused me was the massive, onstage replica of Vienna’s Schoenbrunn Castle, Rieu’s enormous traveling set that measures 410 feet wide, 100 feet deep, and 115 feet high. It comes complete with a pair of real ice rinks and a grand ballroom measuring nearly 900 square feet, all decked out with shimmering golden chandeliers, an authentic hand-painted ceiling, splashing fountains, and 14 carriages pulled by 36 horses. I’ve loved the music of Johann Strauss II all my life and I really don’t think it needs that kind of help. All artistic considerations aside, I’m sure the upcoming concert at the AT&T Center will be a memorable show. The Mid-Texas Symphony will open their season with a special concert dedicated to the heroes of 9/11. The concert begins with director David Mairs’ composition Lacrimosa et Benedictus (For the Victims). The program continues with Aaron Copland’s much loved Lincoln Portrait and Beethoven’s monumental Symphony No. 3, Eroica. The location is Seguin’s Jackson Auditorium, 4:00 pm. Here is David Mairs talking about his composition. The Boerne Concert Band will be featured in a concert on Boerne’s Main Plaza at 6:30 pm. Other groups will also be performing. The first big events of the season on Classicalendar.com are the concerts by chamber ensemble Camerata San Antonio. Most of their concerts are held Thursday in Kerrville, Friday in Boerne, and Sunday in San Antonio. Tonight’s concert will feature music by Haydn, Kodaly, and Brahms. Camerata San Antonio is made up primarily of musicians from the San Antonio Symphony.